“This book can dramatically change your life by showing you how to take responsibility for the choices you make and break free from the illusion that you are a victim of your circumstances.” So begins one of the most significant works you will encounter. People make hundreds of choices every day—both large and small—yet most individuals feel they have little control over their own lives. Now Gary Zukav, author of the monumental #1 New York Times Bestseller, The Seat of the Soul, joins his spiritual partner Linda Francis in a revolutionary look at the power of choice and how to use it wisely. In another New York Times Bestseller, The Mind of the Soul, they explain how changing your decision-making can help take control of your life by creating authentic power. The Mind of the Soul describes how each moment in life is a moment of decision. Will you create destructive and painful consequences? Or will you create constructive and healthy consequences and step into your fullest potential? Using the same pragmatic terms that made The Heart of the Soul so meaningful, Zukav and Francis help you to develop, step by step, the ability to break free of unconscious choices that hold you back and limit your fulfillment in life. Transform your orientation from victim to creator. Experience this fundamental shift that lies at the heart of spiritual growth. The Mind of the Soul is a book to be used, not merely read. It is packed with specific, practical exercises, diagrams, and meaningful illustrations that make you a participant in the process of responsible choice. The discoveries you make in the book and the companion Self-Empowerment Journal will become a permanent part of your life long after you have closed the last page. The greatest gift you have to share is your presence. 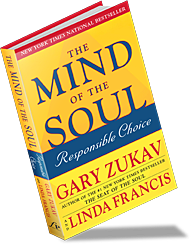 Spiritual partners Gary Zukav and Linda Francis are compelling guides as they explore responsible choice and the power of unlimited potential from the New York Times Bestseller, The Mind of the Soul. Discover what does or does not work for you, learn to change yourself instead of blaming others, open your heart, and develop authentic power.